While brands like Mercedes, BMW, Audi, and Cadillac may have invented the luxury-car business, pickup trucks — which were once simply the mainstay backbone of farms and the construction industry — are now increasingly in the luxury business. Luxury pickups offer a combination of beautifully styled exteriors, startling luxurious interiors that are library quiet; flush with supple leathers; real wood veneers; high-tech features like widescreen, color, and multi-touchscreen operating controls; and advanced, innovative and state of the art safety features. On top of all, you’ll find panoramic sunroofs, premium surround-sound infotainment systems, 360-degree camera vision, selectable drive and ride modes, embedded Wi-Fi hotspots, advanced engine and powertrain choices, and a dizzying and endless amount of opulent mechanical and technical extravagances that can overwhelm the driving experience. The Cadillac brand has been GM’s superlative luxury marquee, but in recent years has been struggling, giving up precious market share to brands like Lexus, Audi, and Mercedes-Benz. The bright spot for Cadillac has not been its sedans, rather its large truck-based Escalade and longer version Escalade ESV. The Escalade is basically a pickup truck adapted as a pickup-based SUV. What shoppers should know is that both the Chevrolet Silverado and GMC Sierra full-size pickups are built on the same platform as the Cadillac Escalade. 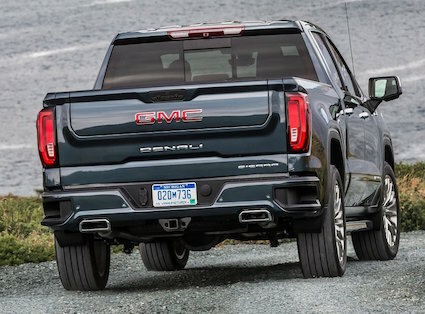 The luxury pickup tested here, GMC Sierra Denali, gives up nothing to either the Escalade or German and Japanese luxury entries, for less money. To be clear, the Escalade and ESV are SUVs and not pickup trucks. Cadillac did offer a pickup truck called the Escalade EXT that was introduced for the 2002 model year, but it never caught on with the buying public and was discontinued after 2013. By now you’re probably thinking to yourself that I can’t be serious — a GMC pickup truck is comparable to a Mercedes or an Audi? Or, you might be thinking “I can’t see myself driving a pickup.” Actually, I am serious and here’s why. Further, truck drivers love the elevated driving position and a commanding view of the road. Plus, they feel the large vehicle is safer than a sedan. Further, when equipped with four-wheel drive, it becomes the perfect go-anywhere vehicle: snow-packed streets and highways, off-roading rugged trails, and forest roads. 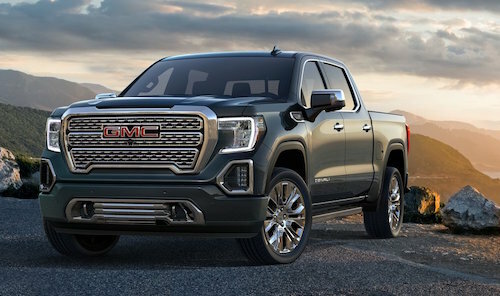 Our 2019 Denali AWD four-door crew cab, powered by a 6.2-liter 420-horsepower V-8 with a 10-speed automatic transmission is the flagship full-size GMC truck. All 6.2-liter V-8 powered Denalis come standard with AWD. The standard Denali engine is a 355-horsepower, 5.3-liter V-8 and an eight-speed automatic transmission. A turbodiesel V-6 is expected to be added to the lineup later in the year. Almost everything about the new Denali is larger than the model it replaced. This is evidenced by the massive amount of interior room with its three extra inches of rear seat legroom. It also has a larger wheelbase, a wider cargo box that includes a spray-on bedliner, and GMC’s new and intriguing MultiPro tailgate that has a two-stage gate with a wide range of usability and positions. It’s actually two tailgates in one with a smaller, second tailgate incorporated into the top of the main tailgate that can be elevated as a table, used as a load stop or a step that can handle up to 375 pounds. It can also be used as a seat when folded in the down position. Think of it as the Swiss Army knife of truck tailgates. The Denali also has the largest chrome grille we’ve seen on any full-sized pickup truck, that’s multidimensional with extensive chrome bright work surrounds looking expensive and fantastic. Bumpers are body-colored and the truck rides on standard 20-inch wheels, with 22-inch wheels available. 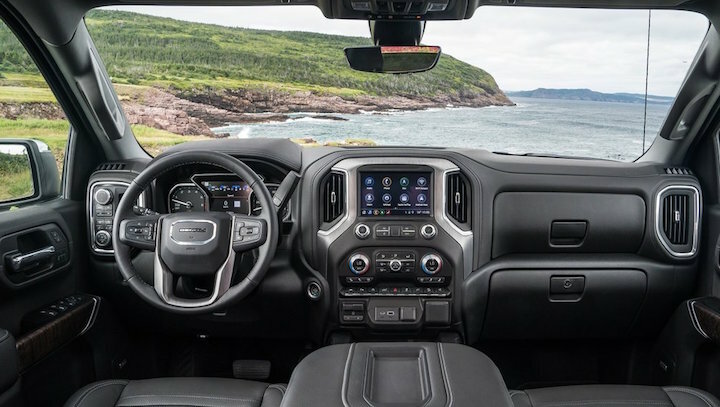 The interior is accented with Denali-exclusive materials, including premium Forge perforated leather-appointed seating thats both heated and cooled up front and heated only in the rear, authentic open-pore ash wood trim and dark-finish aluminum décor add to the up scale look. There’s a heated, leather-wrapped steering wheel and a Premium Bose® Audio System both included. Our test truck came equipped with the $5850 optional Denali Ultimate Package that includes HD Surround Vision, inside rear view camera mirror and multi-color head-up display, forward collision alert, lane keeping assist with lane departure warning, low speed forward automatic braking, power sunroof, power retracting running boards, remote start so you can pre-heat or cool the cabin as desired. 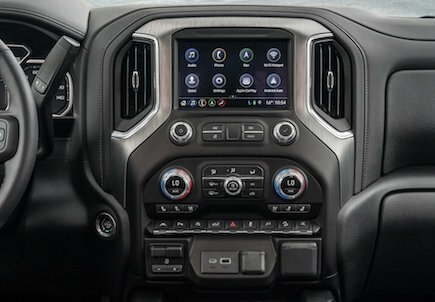 It’s worth mentioning that, while the new interior in the 2019 Denali is the best GMC has built and it indeed is luxurious, we think the interior in both the new RAM Laramie Longhorn Edition and the Ford F150 Limited or King Ranch is a step above, with extensive detailing found in no other trucks. 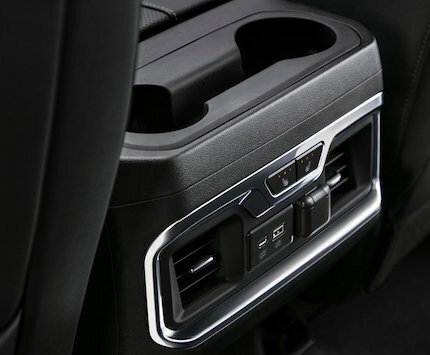 On the road, the Denali’s standard magnetic ride control suspension renders the ride quality nearly as comfortable and cosseting as a luxury sedan. Power from the large V8 comes on quickly, linear, and predictable, delivering the sort of connection between driver and truck that only enhances the joy of the driving experience every time you slip behind the wheel. We were also impressed with its extensive suite of trailer system features, which include not only assistance while backing up and aligning the hitch, but also the ability to individually test each trailer light and access a need-to-do checklist before towing via an app or on the infotainment screen. With a tow rating of 9600 lbs. and a payload of just over 2000 lbs., the Sierra falls just short of class leaders but is competitive with real-world uses and practicality for the vast majority of pickup buyers. All this goodness doesn’t come without a hefty price tag that added up to our window sticker price of $67,340. Yet, when considering everything you get for that price, plus the all conveniences afforded from a truck, the commanding seat positions, massive cabin room, advanced tech features and traditionally high resale value, it’s a bargain when compared to luxury German sedans similarly equipped. For example, a midsized Audi A6 sedan with the Prestige trim level and similar equipment starts at a nearly identical $67,100 price. 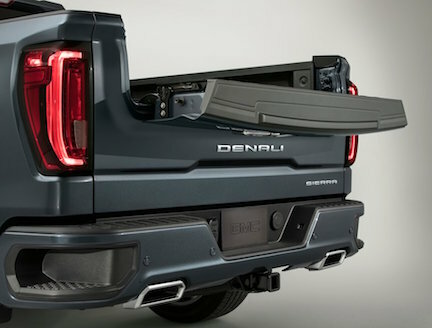 But doesn’t include any of the trailer towing systems, and versatile features you get with the Denali. Bottom line, if you’re out shopping for a mid or full-size luxury sedan, don’t dismiss out of hand test driving the new Denali. You just might find yourself owning one and falling in love with it like so many Americans already have. Crash Test Ratings: National Highway Transportation Safety Administration 5-star side crash, 4-star rollover rating. Not tested by the Insurance Institute for Highway safety.